The folks at Fargo have made it simple to get started printing ID cards. Their pre-configured bundles contain everything needed to begin card production quickly, including printer, software, print-ribbon, and blank cards. 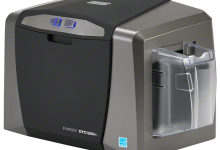 The FARGO® 1250e card printer/encoder is the ideal card printing solution for small businesses, schools, and local governments. The FARGO® 1250e card printer/encoder is the fastest printer in its class, allowing you to produce 50% more visually-rich, full-color credentials in the same amount of time. Its compact footprint makes it easy to use in a variety of office environments and can be easily upgraded to include an embedded iCLASS SE® encoder (part of the iCLASS SE platform), enabling you to produce secure, personalized membership and loyalty photo IDs in one single, seamless step. An optional Wi-Fi® accessory is also available to help you print anytime, anywhere. Using the included FARGO Workbench™ diagnostic utility software can help you easily maintain your printer over time. The DTC1250e also features an intuitive, user-focused SmartScreen™ graphical display, enabling efficient set-up, operation and maintenance.